UK’s Willie Cauley-Stein puts the hammer down on Cincinnati. It wasn’t a pretty game to watch in Louisville but it counted all the same. The number one overall seeded Kentucky Wildcats won a rough physical contest in its round of 32 matchup over a focused Cincinnati squad 64-51. The Wildcats are the first team in NCAA history to start a season with 36 straight wins and will advance to the Sweet Sixteen in Cleveland on Thursday, where they will face the winner of the Maryland-West Virginia contest. The mantra to repeat throughout March Madness is to “survive and advance”, and that is exactly what Kentucky did. On paper the 8th seeded Bearcats were no match for these blue blood Wildcats, but they had a game plan. By playing an attacking defensive zone, collapsing on Kentucky’s bigs violently, and making UK guards hit outside shots they kept it close. Normally Kentucky would make you pay for playing that zone, but its shots were not falling. Cincinnati lived up to its team’s thug past, from the days when current West Virginia coach Bob Huggins walked their sidelines, and instigated contact to remain competitive with Kentucky for most of the first half in a low scoring affair. In particular Octavius Ellis made sure to stick his shoulder in the path of Kentucky players during dead balls to try and draw a response. Like in football fights, the refs rarely see the initial offense, it’s the retaliation that gets flagged, and that is how the first half went until the game got to under the three-minute mark. 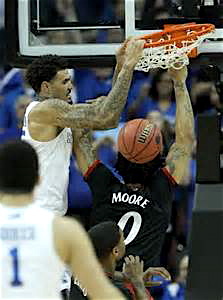 With Cincinnati up 24-23, guard Tyler Ulis dished a pass in stride to 7’1″ forward Willie Cauley-Stein who slammed down a ferocious dunk on the head of Quadri Moore and Octavious Ellis, getting fouled in the process. This swung the momentum. Cauley-Stein hit the free throw to put Kentucky up a deuce, and Ellis had to be removed from the game and taken to the locker room due to a back injury. Moore looked stunned as he sat on the court and had to be helped up. I’m not sure that boy ever came back into the game. This was more than just another NCAA game. Southern Ohio, where Cincinnati is located, borders Kentucky, and these two programs don’t like each other. Mainly I imagine Kentucky looks down on the success Cincinnati used to enjoy and doesn’t feel they deserve the recognition of playing a blue blood team like Kentucky. The last time they played was 2005, and Cincinnati came into this game like a little brother that had been pushed around by an older sibling. They were ready to fight and wanted Kentucky to give them some respect. The Cats were all business but it took them the better part of the first half to crank their game up to match the emotion and intensity Cincinnati brought to the court. Thankfully the Bearcats couldn’t hit many outside shots, whether open or otherwise, shooting just 31 percent. The dunk by Cauley-Stein ignited a 10-0 run by the Cats to close the first half and gave them a seven-point halftime lead. And yes they were up. As bad a half as it was the Cats were up seven. Kentucky didn’t shoot well either, registering a pedestrian 37 percent from the field and an atrocious 14 percent from 3-point land. But Tres Lyles gave them a double/double, Aaron Harrison poured in a team high 13 points, Cauley-Stein added nine and Tyler Ulis turned in a key game with nine points, five assists, three rebounds and three steals. Devin Booker had another rough night of shooting, but others stepped in to fill the void. Pressure and time is all it takes before Kentucky’s depth, height and ability cause opponents to crack. You get under the eight minute mark in the second half and the defensive pressure these Kitty Kats play, and their relentless attacking of the basket, eventually takes its toll and teams wilt. As I believe Kenny Smith pointed out yesterday, this UK team has the largest margin for error of any team in the country. They have the ability to not be playing well and still win games. That’s not true for any other school. Just ask Villanova. We’ve seen Duke play modestly and they lose badly. Same for Arizona, Gonzaga, and Wisconsin. Don’t even bring up Kansas. Kentucky beat them like they stole something back on Nov. 18, 72-40. And North Carolina thought they had game till UK punished them on Dec. 13, 84-70. That’s the thing about playing Kentucky, after they are done beating you doctors need to check opposing players for Post-Traumatic Stress Disorder. Watch out Cleveland the Kentucky Wildcats and Big Blue Nation are coming Thursday, 36-0 NOT DONE! This entry was posted in Events, News and tagged Cincinnati Bearcats, Kentucky Wildcats, March Madness, NCAA Championship. Bookmark the permalink.